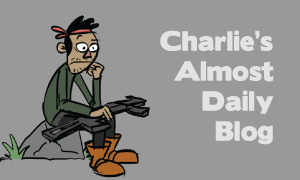 Fangamer's Charlie tries to post something every day. Would You Still Love Me If I Was a Guy? Recently, a friend of mine came out as a trans man. Or possibly nonbinary. It seems like they're still on that journey of self-discovery, but regardless they do know that they don't really identify as a woman. And they're preparing for a transition. Naturally, they have my full love and support, and I told them so. Afterward, though, Laura noted that this friend's husband (who was well aware this transition was coming since long before they were married) was very supportive of the transition. Laura casually mentioned that she wasn't sure I would be as supportive if it were her. Naturally, as such casual comments are wont to do, it kinda stuck with me. She made that assertion weeks ago, and I've been thinking about it ever since. It's sparked a fair bit of self-reflection. So, what follows are some rambling musings as I search for answers. Naturally, given who I am, I'll start by talking about a video game. It’s been a while since the last time I wrote anything outside of work or D&D notes. I wanted to get back into the habit of writing a few months ago, though, so I found a nice softball topic: this “30 Day Song Challenge.” I didn’t see any reason to spread this out into 30 days, so I just did the whole thing at once. And then I promptly filed it away and never did anything with it. And I absolutely did not get back into the habit of writing. Anyway, I found it again and figured now is as good a time as any to post it. Enjoy this 30 day song challenge. With the passing of Ron Glass, many people have different reasons for remembering him. Like many people my age, I was primarily familiar with him through his portrayal of Shepard Book on Firefly. I have a bad habit of getting into arguments with people online. I would say I spend too much time on it... but I'm not sure that's true. The alternative is to avoid engaging with people, which seems like the sort of action that perpetuates this culture in which our views and the views of others are never challenged. We will likely never understand each other so long as we never make the effort to do so. So, I get into Internet arguments. They're not always productive, and I don't think they result in changed minds per se. However, I don't mind making the effort to humanize my ideas and to at least attempt to understand where people are coming from. However, if I'm going to spend a bunch of time writing like that, I should probably get some use out of it. Otherwise, all that work will simply fade away, banished to wherever it is that old Facebook posts go. So, here's a discussion I had with some folks in response to a post my aunt made on Facebook. Unedited except for names, though I don't think the discussion is private, so theoretically anybody can find this discussion if they look for it. My most recent video is up, the first real episode of my Constitution Series. It's incorporating a lot of the stuff I've learned in the past few months, and I think it's on the verge of being respectable. That said, I still have a lot to improve upon, some of which I figure will come with practice, some of which I'm already planning to fix. This post is about some of those ways I'm planning to improve. Today, she was telling me about a Tumblr post that included a strange list of possible instruments found in the Complete Bard's Handbook from 2nd Edition D&D. The list of instruments is pretty comprehensive, from drums and flutes to citterns and sistrums. Laura seemed doubtful that some of these instruments would be terribly inspiring or practical during battle. After all, while a pipe organ might sound incredible, it's not exactly easy to carry onto the battlefield. And then there are one-note instruments like gongs and castanets--not exactly ballad material. These possibilities had me intrigued, though. While I can't really comment on the instruments I've never heard of (a hurdy gurdy sounds fascinating in theory...), I immediately had some ideas about some of the more familiar instruments.